As the seasons change and the weather warms up and it’s light in the evenings, us ocean swimmers start to mix things up a bit. During the winter we’ve been focussing on endurance and strength (and practicing with challenging surf conditions), and that’s the prefect time for it. Now racing season is looming and it’s time to think about what we need to do to do well at the events. Technique. Worth revising to make sure we’re optimising power forward through the water, minimising drag against the water, and not injuring ourselves doing it. Speed. Or in other words, cardio vascular fitness. Ramp up = More sessions. To that end, 4SEAsons have switched their Wednesday night sessions to technique night! This is brilliant for me (this week, anyway)…as my technique is kinda, well, suboptimal. ahem. Technique is one of those things where you have to aim for continual improvement, not perfection. It’s such a complicated thing you’re doing, using your whole body, and there’s really no single answer to the right way to swim. Different body types, different conditions, different habits, different strengths and weaknesses and injuries…it is really a lot of variables. On Wednesday night we worked on a couple of drills designed to help with arms and timing. To help with this we used fins for the first time in ages, as they give you extra propulsion through the water and allow you to concentrate on slowing down your stroke to concentrate on different aspects of it, without feeling (all the time) like you’re going to drown. I use these Speedo BioFUSE as they’re pretty inexpensive, fit in a backpack, and that’s what was in stock when I was shopping and they do exactly the job they need to do, exactly the way I want them to, so I’m pretty happy. (Not sure that fins could be life-changing, so don’t want to get too weirdly overly enthusiastic here). You’ll note these are pretty different to diving or snorkelling fins. They’re a lot shorter, for a start, and quite rigid. This is because they’re designed for a distinctly different purpose. Dive\snorkelling fins are designed to give as much propulsion as possible with as little output of energy as possible (when diving, so you use less air and can stay down longer before your tank runs out). These fins are just designed to give you a little bit more than a regular kick…mostly to work on different aspects of your stroke, catch, or return. They do have a slight down-side for some people (me included). Wearing fins does make you more susceptible to foot cramps. I’m not exactly sure why, but I know that I need to make sure I relax while swimming and stretch out well when the inevitable cramps hit. Not a biggie or a deal-breaker, given the benefits you can get from using fins in your drills, but something to be aware of. After getting inspired and talking about swimming straight last week, Saturday’s swim proved the perfect opportunity to practice the skills needed to pull off this difficult feat. 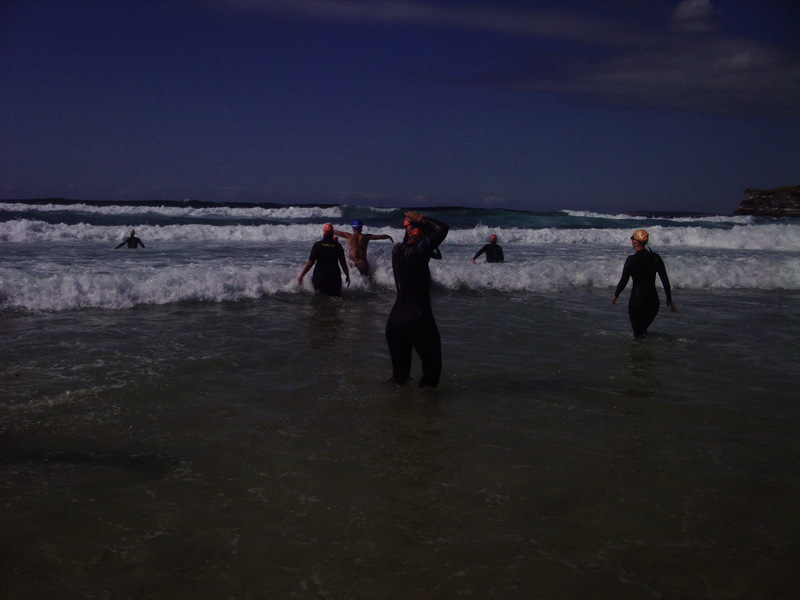 As I mentioned in the report on Saturday’s training, there was a surf ski race starting at Bondi around the same time we started training. For this race they had put out a couple of buoys for the turn around the south end of the heads. Too good an opportunity for us to pass up at this end of the season! Coach Zoe set us out from the middle of the beach headed straight for the buoy…just like in a race! This really got me thinking about three ways you can improve your ability to swim in a straight line. The first two are fairly simple, but I’m pretty sure I can manage to ramble at length about the third! Firstly – Breathe bilaterally. I know lots of people hate doing this for various reasons, some people find it difficult, and it’s not always possible (especially in open water if you have a big swell or break on one side), but really, it’s just common sense that if you’re breathing evenly to either side, there’ll be less opportunity for any bias in your stroke to really veer you off in one direction. Secondly – Good, even technique. Just about everyone has one arm (and leg) stronger than another, but focussing on good, even technique at training will also reduce any bias in either direction. The third, and arguably most significant thing you can do to swim straight, is to work on your sighting. Sighting is the technique we use in open water swimming to allow us to have a look where we’re going regularly without having to stop or slow down, or drop our body more vertically in the water than completely necessary. Technically speaking, sighting involves lifting your eyes above the waterline ever so slightly…literally just enough to get a look in front of you. Ideally (in flat conditions) the rest of your head should come out of the water. This is because the more you lift your head, the more your body drops in the water, and the more drag you create. Here’s a great video showing a swimmer doing a pretty good job of it…. Of course, the bigger the waves, the harder this is to do. You may need to look up a bit higher, but a good trick under these conditions is to do your sighting when you’re at the top of a wave, not in the trough. Also part of the art of sighting is to figure out how often you need to sight. As a general rule, you should sight less, rather than more often. Even if your sighting technique is pretty efficient, it’s still going to create more drag than not sighting at all. the trade-off, though is that going off course is worse again! So you need to continually reassess throughout a race (or training swim). If you’re pretty confident in your ability to swim straight because of your technique you would usually sight less, but if you know you’re a bit prone to the zigzags, by all means check more often. Conditions also have a part to play on sighting. If there’s a swell or big waves or a rip or a current of anything else driving you off course, by all means sight more often. The other part of sighting, is a bit of an art form rather than a technique. Generally when you swim, you don’t get much elevation above the waterline, and buoys really aren’t that big most of the time (and some of them aren’t in particularly contrasting colours, either!). Add waves or a swell to that equation, and it becomes really hard to spot that buoy when you’re sighting. What to do? The trick is to line up the buoy with something you can see easily from water-level and from far away. This can be any number of things – outcrops, buildings, cranes, tall trees, flags, shade sails…the list goes on. Please don’t pick something that moves, though! Clouds, boats, lifeguards, other watercraft or water-users all have a tendency to move so don’t make particularly good landmarks. Once you’ve chosen your (non-moving) landmark, swim towards that, until you have the buoy firmly in your sights. When you round a buoy and head in a different direction, pick a new landmark and start the process again. Simple, right? Well, not always, but the principle always remains the same. Here’s another great video with some examples of techniques for swimming straight…. I don’t know quite how it happened, but I ended up buying another underwater camera. Oops! It floats! Not good for diving, but it was a bit of a revelation when you think about a camera for swimming and snorkelling. The large, raised external buttons designed to be usable by people with cold, waterlogged fingers. It is a rounded and rubberised and just looked somehow easier to operate in the water. No dials or needing to see small symbols. So the camera arrived and I tried it out last Saturday at training, and as you can clearly see from the photos below, it takes RUBBISH photos. Bear in mind these were taken on a bright and sunny day, in full light, not in the dead of night. I managed to do a little post-processing on a few of them to make them almost usable, but by the time I managed to get enough done to them to see what was going on they generally turned out super-grainy. Not good enough at all!I’m not entirely sure what the deal was with this camera. For a start, the buttons were pretty big and simplified for ease of use in the water but this meant it was ridiculously difficult to work out what any of them did or how (most of them had 3 different symbols). I’ll have another go at some point just to check it wasn’t user error and that I didn’t have some crazy setting on, but I think this one may get chalked up to (a bad) experience. Please don’t be like me, and DO NOT BUY THIS CAMERA!!!! After a week marooned on dry land, I was more than ready to be back in the sun and salty goodness at Bondi…and Bondi put on a cracker of a day to welcome me home! It was absolutely stunning…the sun was shining, the water was clear and blue (and warmer than it’s been in a good long while) and the tourists were out in force! There were a few shore-breakers but it was basically flat out the back, so we started out with a medium-ling swim from the middle of the beach out the south head, then back again. We picked up some second-session starters (4SEASons has a second start time for people who do running training before they hit the beach), then jogged down to the North end. We caught the rip out to the North-end boat ramp and then headed diagonally back to the middle of the beach. We did some ins-and-outs for a big, catching a few of those waves. They were a nice size and you could catch a decent ride. There was certainly none of the rough and tumble of last week, but that didn’t mean the ride was without its own set of hazards. It was kinda crazy! In a couple of weeks as the weather heats up and the parking gets tougher we’ll start training earlier in the morning. Until then, sharing the beach isn’t really too much of a trade-off for the glorious day’s swim. And it was GOOOOD to be back in the water! Apologies for anyone wondering what’s become of me! I threw my neck out last after last Saturday and have had great difficulty with both swimming and typing…neither of which is much good for keeping up regular posts on a blog. A week’s rest, a trip to the osteo and some time off work have done wonders, however, and things seem to be back to normal programming. Hope you managed to talk amongst yourselves while I was gone! It’s never any fun being injured, hurt or sick, but the idea of being out of action this close to the start of the season was not giving me happy thoughts. It’s funny to think, as I’m not naturally an athletic person, but I had a week off all swim and boxing training and I felt like I wanted to jump out of my skin! these days I really can’t handle not exercising…it’s become so much a part of my routine I get seriously ansty if I can’t do it! Ah well, despite what you want, sometime your body just needs rest. Luckily I’ve had mine now and am back in the water! Swimming straight is so important. if you think about it, I might be a slower swimmer than, well, a whole lot of people, but if I can manage to swim in a straight line in a race I give myself a pretty major tactical advantage. I swim less distance and expend less effort. Such an interesting look at how bad we all innately are at swimming in a straight line. Also a good lesson for anyone who only does pool training to compete in races that don’t have the ever-present black line to show the way. Conditions. It’s harder to see the marker buoys when the waves are bigger. The course. Some races have interesting courses. The Cole Classic (most years) starts at Shelley Beach (which is at right angles to the finish line at Manly), then you swim across the bay, and pull a hard right out around the point into open ocean to pull a left at a buoy you couldn’t even see from the start line. 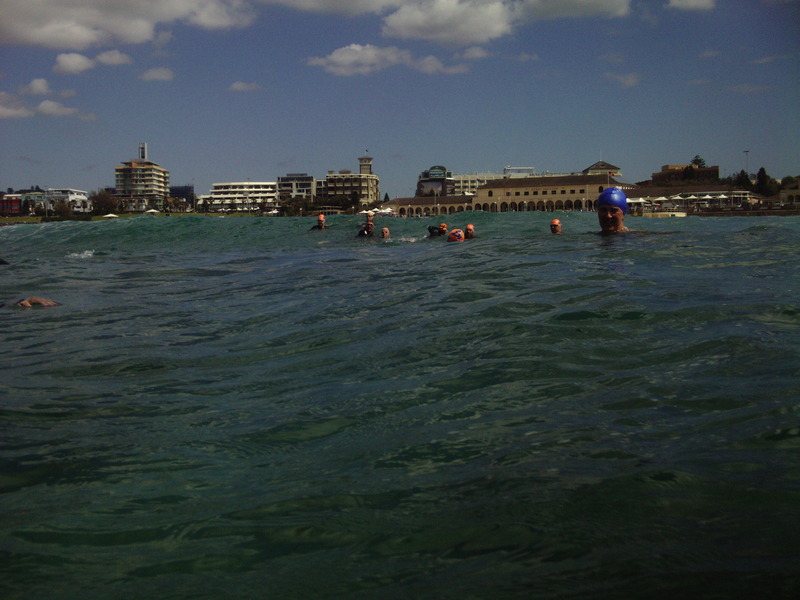 And check out the course from last year’s Tamarama to Clovelly swim. Trust me, it was a looooooooong way between the 2nd and 3rd buoys…all the way along that cliff face! Non-Symmetrical swimming technique. As the swim smooth video points out, bilateral breathing is a good start on this. Technique training should also help. My personal observation is that it’s good to be able to be a bit flexible with these things…adjust for different techniques with different breathing patterns. Other swimmers (part 1). 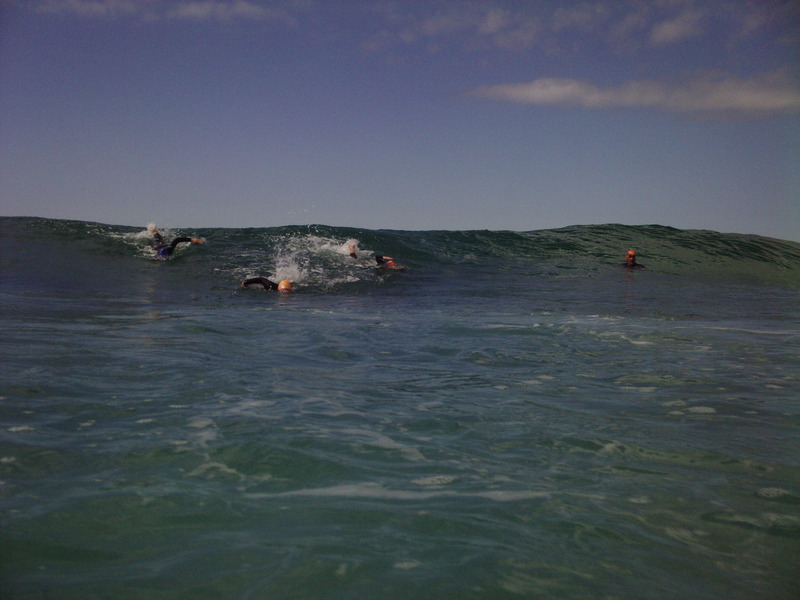 Depending on the layout of the wave starts, especially if you’re not a fast swimmer, you can spend a lot of time with other swimmers overtaking you. Your choice about getting out of the way, fighting them off or trying to jump on their bubbles for a draft, but regardless, it always has the potential to make you lose focus and drift off course. Other swimmers (part 2). As you can see in the previous points, it’s surprisingly easy to find yourself are little lost out there, where you haven’t seen a buoy in a while and you’re not really sure if you are swimming straight or not. There are swimmers in front of you, possibly even stretching out in a line. Aha! You’ve found the right way to go! Crowdsourcing is the way of the future, right? BZZZ Wrong! Those swimmers in front of you have been swimming in e same conditions you have. The same course, the same wave height. What makes you think they know where they’re going any more than you do? You should always plot your own course. Always. Pretty much no exceptions. The only thing worse than swimming off course, is swimming off course because you followed the random stranger in front of you. Wow. Sounds impossible, right? But never fear, there are definitely some things you can do to improve your ability to swim the elusive straight line around the course to the finish. The thing about spring is that you can never really tell what the weather is going to do. And we’ve had some crazy weather around here even for spring. On Friday I got up for my morning boxing class and it was 9 degrees and raining! The Friday before that it was 32 and sunny…so how on earth is a girl supposed to know what to wear? And I tend to have fun on the bigger surf days….bodysurfing! Well for all my bravado, Saturday was actually HUGE!!!!!! It was seriously rough out there and the waves were big and powerful. We were particularly careful..coach Kingy spoke to the surf lifesavers and asked them to keep an eye on us. We also took things very easy and stayed between the flags (although the more experienced bodysurfers went off on their own after a bit). But it was still super hard work. Goggles were lost and salt water was swallowed (and inhaled!). I may have bitten off more that I could realistically handle and tried to catch a wave that was way too big for me. It tumbled me and slammed me onto the sand and held me down. 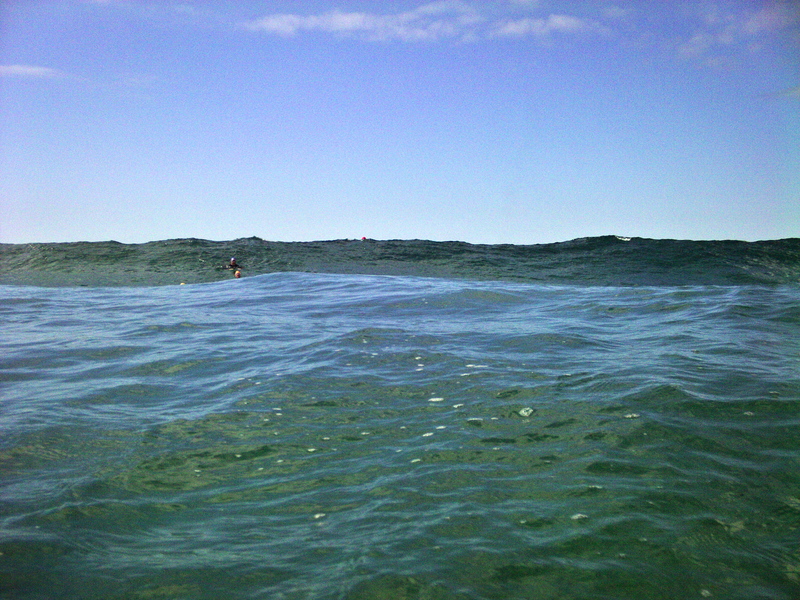 I finally found my feet and surfaced for air…only to get smashed in the face by another wave! It would only have been a couple of seconds total, but it was enough to give a bit of a fright to even a dedicated big-wave swimmer like me. DON’T PANIC!!!! That’s in all caps because it is really, really important. As soon as you panic you’re going to gasp and that’s a quick way to inhale water and really get yourself in trouble. Don’t panic. Even after a couple of seconds under the water, still don’t let the panics set in. I can’t emphasis how important this is. Don’t fight the wave. It’s headed to shore and it’s probably not going to take you the whole way (if it does, though, even better). It’ll roll over the top of you and you can breathe then. Roll with the wave. If you’re trying to fight it, you’ll stiffen up. Firstly that’s energy you should save for when it passes, and secondly, you’re more likely to actually hurt yourself if you do get dumped on the sand. Breathe out. It’ll seem like the opposite of what you want to do, but it’s actually the build-up of carbon-dioxide from holding your breathe that gives you that panicky feeling, not a lack of oxygen. Breathe out slowly and steadily. You can stay down without a lungful of air for a couple of seconds without any problem (practice in a pool if you don’t believe me) and whilst it feels like a long time, that’s generally more than enough time for the wave to pass over the top of you. If you can find the bottom, give yourself a good push off. It’s easy to get disoriented so don’t fight in a particular direction unless you’re sure it’s “Up”. Open your eyes and look as you break the surface of the water…the first thing you want to know is how far away the next wave is. If you’ve fought your way in after a nasty dump, don’t be afraid to sit out a set. If the adrenalin is still flowing, in particular. It’s OK to give yourself a little chance to catch your breathe and calm down on dry land. But don’t stay out tooooo long. Back on the proverbial horse before it beats you!